Back when I placed my one and only Chemistry order (after Stef first showed us Chemistry 507), I ordered Chemistry 519. 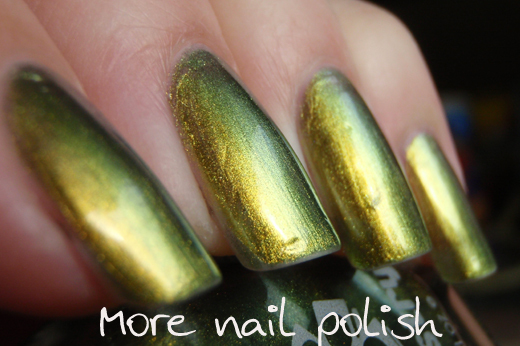 This was another polish that I ordered totally sight unseen. I just picked the number cause I knew I didn't have it and hoped for the best. I was rather surprised then it arrived, because it appeared to be an exact dupe of 507! 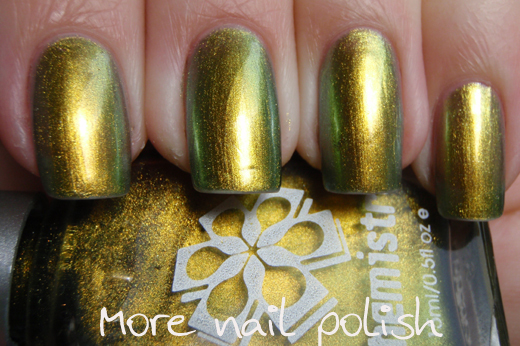 These photos are taken on day two, and there is a bit of tip wear, but generally these Chemistry polishes (like Ozoitc) wear really well and they certainly don't chip. In a effort to make this look different from Chemistry 507, I just applied this on it's own, without the usual black base. This is three coats with one Seche Vite top coat. I actually really love it on it's own. 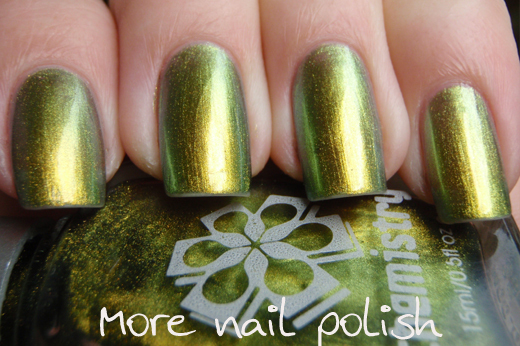 I've given this polish to my Mum, and she has done some beautiful layering with it. I'm totally going to steal her ideas and post my mani pics here. Thanks again Mum. Hey girls with a few chemistry polishes (I'm looking at you Claire, Stef and Kristy) do any of you own both 507 and 519? Do yours look identical too, or did I just get a bottle that was incorrectly labeled with the wrong number sticker? i haven't got 509 but i've got the same 517 as you! 519 i mean 519 not 517 d'oh! I saw both 509 and 517 at the warehouse. Both are identical. You're not imagining it! Anyway, I'm also eager to know whether 519 and 507 are dupe. Margie - yes, if you want spectraflair too and are happy to wait until I get it, I can combine postage. Just let me know in an email. Millie - gotta love that chemical goodness. Come to think of it, I've never looked under the label to check Ozotic ingredients. This would mean they are not 3 free either. Thanks Millie, Kristy, Stef and Claire - We officially declare 507 and 519 dupes. I think it looks great without the black base coat! Absolutely gorgeous! Want this one muchly!